Serve your favorite Italian pasta dish with this interestingly colorful ribbon pasta by Marella. 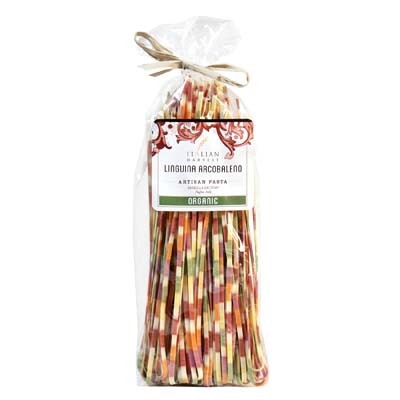 Linguine Arcobaleno is not only crafted by hand but it’s also made with 100% natural ingredients. In fact, the array of colors in these ribbon pasta are from naturally dehydrated vegetables. Perfect for making beautiful pasta dishes, this pack is great with cream and pesto sauces. And if you want a much simpler sauce, to better display the pasta’s bright colors, you can also just use butter and Parmesan cheese. All Organic Marella Pasta are expertly handcrafted and made with the best ingredients available. In fact, it is a recipient of the 2013 Silver Sofi Award for “Outstanding Product Line”.